As any young professional knows, where you start your career is important. You want to be in a place that offers high pay and good opportunities. Unfortunately, some of the places that come to mind when thinking about careers, tend to be the places with the highest costs of living, like New York or San Francisco. Below we crunch the numbers to find the best cities for young professionals in America. Making a move? Find out if you should be renting or buying. In order to find the best cities for young professionals, we looked at data on nine metrics. We looked at percent of residents aged between 25-34, the unemployment rate for young adults, the labor force participation rate for young adults, median rent, number of fun establishments, job diversity, median earnings for full-time workers and rent as a percent of income. Good variety – Sometimes our articles show clearly that one part of the country is better than other for certain things. For example if you want affordable housing, you probably have to leave the big cities. Or if you want good coffee, head to the West Coast. But we found there are good career options for young professionals all across the country. Every region of the country, except the Northeast, has at least one representative in our top 10. Big differences – This article clearly shows how important location can be to a career. Take Memphis for example and compare it to Nashville. Both cities are in Tennessee but Nashville is better for young professionals than Memphis. Memphis residents between the ages of 25 and 34 have an unemployment rate above 10%, while in Nashville the same statistic is 3.25%. 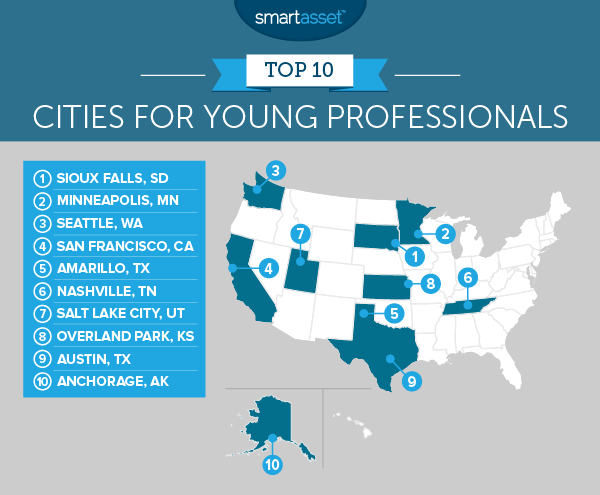 Sioux Falls is the best city for young professionals. This city is great for those looking for opportunity. At 2.9%, this city has the sixth-lowest unemployment rate for young people (those between the ages of 25 and 34) in the study. Sioux Falls is also a fun-loving town. According to our data, just under 2.9% of establishments here are built for entertainment or the arts. The City of Lakes takes second place. 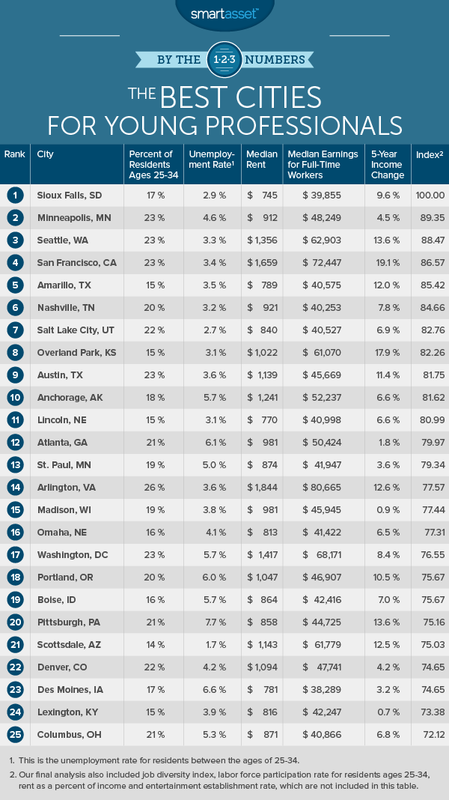 One reason why Minneapolis scored so high is because it is affordable. According to our data, the median rent of $912 per month would only take up around 23% of the average full-time worker’s salary. With only 23% of income going to housing, a decent chunk of change should be freed up for having fun. Another plus to living in Minneapolis is that it seems there is plenty on offer for young adults. Over 91% of young adults (those between the ages of 25 and 34) are in the work force. Seattle might scare off some young professionals because of the high sticker price on its homes. The median rent in Seattle is over $1,350 per month, for example. However, full-time workers here also tend to earn quite a bit. The average full-time worker earns just under $63,000. Plus, Washington state has no income tax, so you keep more of what you earn. Workers in Seattle also seem to be getting plenty of raises, something every young professional in Seattle will be glad to hear. The average full-time worker in the area earns 14% more in 2015 than they did in 2011. That is the eighth-largest raise in our study. If Seattle rent prices spooked you, you may want to look away. According to our data the median rent in San Francisco was over $1,650. But San Francisco workers, like Seattle workers, tend to be well compensated. On average full-time workers in San Francisco earn over $72,000 per year. Still, rent eats up around 27% of that salary, on average. San Francisco is also a great spot to meet other young like-minded people. Our data shows that around 23% of residents in San Francisco are aged between 25-34. Plus wages here are rising. The average full-time workers in San Francisco earns 19% more in 2015 than they did in 2011. Nashville is best known for it’s music scene, but its also a great place for young professionals. This city took sixth because of plentiful jobs and availability of fun. This city has a young adult unemployment rate of 3.25% and over 4.2% of establishments are dedicated to the arts, entertainment or recreation. For both of those metrics Nashville scores in the top 10. Music City has plenty of other young adults around, too. Just under 20% of the residents in Nashville are between the ages of 25-34. Utah’s capital takes seventh. This is a young city, around 22% of its residents are between the ages of 25-34. Only 2.69% of those young adults face unemployment. For both metrics, Salt Lake City ranks in the top 10. Salt Lake City is also relatively affordable for full-time workers. The average worker here earns about $40,000 per year and median rent is about $840 per month. That means the average full-time worker will be putting about a quarter of their income toward housing. That puts them under the HUD’s recommendations of spending less than 30% of income on housing. But if you’re looking to party, Salt Lake City may not be the place for you. Only 1.25% of establishments in the Salt Lake area are dedicated to entertainment, the lowest rate in our top 10. Overland Park is another city which leaves a bit to be desired in the fun department. Only 1.27% of establishments here are dedicated to entertainment. But if you’re a young adult who wants to put their head down, work hard and forge a promising career, Overland Park is a great place to be. The unemployment rate is only 3.1%, suggesting there is plenty of opportunity in the area. The average full-time worker earns over $61,000 per year. That is a similar amount to what Seattle residents make. However Overland Park residents are not paying Seattle-style rents. The median rent in Overland Park is $1,000, meaning the average full-time worker spends only about 20% of their income on rent. Another bonus for young professionals in Overland Park: From 2011 to 2015, the average full-time worker received a raise of about 18%. Texas’ second city in our top 10 is Austin. This is a great city for creatives, so it’s not surprising to see that Austin is a fun place to live for young adults. First of all, Austin has plenty of young adults in the area. The city ranks in the top 20 for residents between the ages of 25-34. Plus, there is plenty to do. Just under 2% of all establishments in Austin are dedicated to entertainment. If you’re worried about money or jobs, Austin has you covered. The unemployment rate here for young adults is only 3.57%. But watch out for the housing costs, the average full-time worker would need to put up 30% of income to pay for housing. That’s the worst score in that metric in our top 10. Our list rounds out in Anchorage, Alaska. If you’re looking for a career which is off-the-beaten path, Anchorage may be the place for you. Thanks to abundant natural resources in the local area, there are plenty of different types of jobs around Anchorage. These jobs also tend to pay well. The average full-time worker in Anchorage earns over $52,000 per year. Finding work in Anchorage may be slightly more difficult than it is in other cities in our top 10. Anchorage has a 5.66% unemployment rate for young professionals. Percent of residents between the ages 25-34. Data comes from the Census Bureau’s 2015 1-Year American Community Survey. Unemployment rate for young professionals. This is the unemployment rate for residents ages 25-34. Data comes from the Census Bureau’s 2015 1-Year American Community Survey. Labor force participation rate for young professionals. This is the labor force participation rate for residents ages 25-34. Data comes from the Census Bureau’s 2015 1-Year American Community Survey. Median rent. Data comes from the Census Bureau’s 2015 1-Year American Community Survey. Entertainment establishment density. This is the percent of all establishments in the area dedicated to arts, entertainment or recreation. Data comes from the Census Bureau’s 2015 County Business Patterns Survey. Job diversity. This measures the variety of industries available in a city. We used the Shannon index to calculate this figure. Data on occupations comes from the Census Bureau’s 2015 1-Year American Community Survey. Median earnings. This is the median earnings for full-time workers. Data comes from the Census Bureau’s 2015 1-Year American Community Survey. 5-year income change. This is the percent change in median earnings for full-time workers from 2011 to 2015. Data comes from the Census Bureau’s 2015 and 2011 1-Year American Community Surveys. Median rent as a percent of full-time worker’s earnings. Data on median rents and earnings comes from the Census Bureau’s 2015 1-Year American Community Survey. First, we ranked each city in each metric. Then we found each city’s average ranking, giving each metric equal weighting. We used this average ranking to create our final score. The city with the best average ranking received a 100. The city with the lowest average ranking received a 0. If you have found yourself at the stage in life where you are able to save, it is probably a good idea to start strategically planning for retirement. Here are some tips to get the most out of every dollar you save. Make sure to take advantage of employer matching on any 401(k) contributions, if it’s offered. There is no downside to maxing out your employer match, it’s free money. If you have some cash left over, after maxing out your employer-sponsored 401(k) matching, consider saving in an IRA.There are two different types of IRAs, a traditional IRA and a Roth IRA. The difference is whether you contribute to them with pre-tax income or post-tax income. With a traditional IRA, you contribute pre-tax income. This means then you have to pay taxes on the money once you withdraw it. With a Roth IRA you contribute post-tax income, but do not pay taxes upon withdrawing. Basically, if you think you will be in a higher income tax bracket come retirement, you may want to open a Roth IRA. But if you think you will be in a lower tax bracket when you retire, you may opt for a traditional IRA. Finally, both 401(k)s and traditional IRAs come with early withdrawal penalties. This means if you take money out of your traditional IRA or 401(k) before the age of 59.5, you will have a 10% penalty. There are exceptions to early withdrawal penalties like using the money you withdraw to pay for medical bills or for a first-time home purchase. But it’s best if you don’t think of your retirement accounts like a savings account. You should just put the money away and not touch it until retirement.